To some they are the “orbs” of autumn, the quintessential symbol of fall, making their graceful entry into hearts and homes. The names, alone, captivate childlike feelings of giddiness; Aladdin, Baby Boo, Cinderella, Cotton Candy, Jack-Be-Little, Jack-Be-Quick, Full Moon and Wee-Be-Little. Why, then, are we so fascinated with pumpkins? Consider these facts: * The word pumpkin originated from the Greek word Pepon which means large melon. The word gradually morphed by the French, English and then Americans into the word “pumpkin”. Pumpkins and squash are believed to have originated in the ancient Americas. * Early Native Americans roasted pumpkins strips over campfires and used them as a food source, long before the arrival of European explorers. 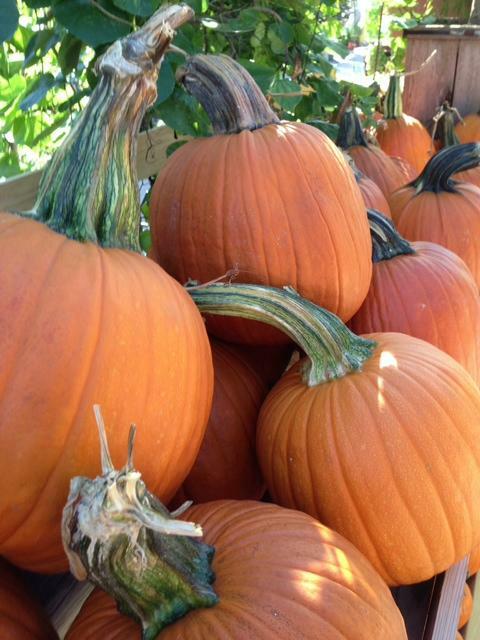 Pumpkins helped The Native Americans make it through long cold winters. They used the sweet flesh in numerous ways; roasted, baked parched, boiled and dried. They ate pumpkin seed and also used them as a medicine. The blossoms were added to stews. Dried pumpkin could be stored and ground into flour * Columbus carried pumpkin seeds back with him to Europe. * Indians introduced pumpkins and squashes to the Pilgrims. If it were not for pumpkins we should be undoon”. 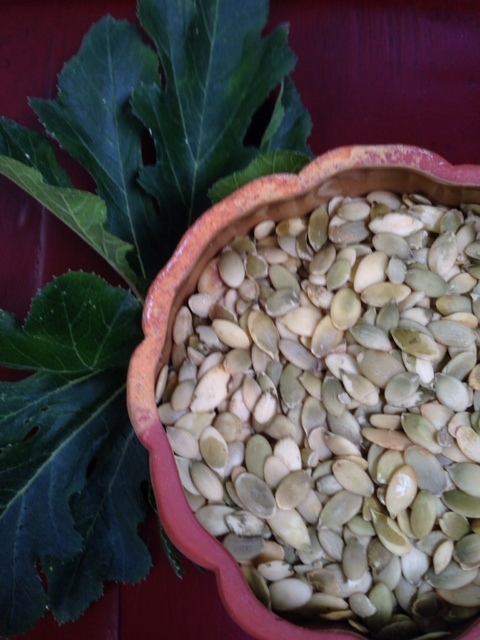 The best way to eat pumpkin seeds is raw – this preserves the healthy fats in the seeds. If you prefer to eat the seeds roasted use this simple recipe: Roast raw pumpkin seeds on a low heat setting in your oven (no more than 175 degrees F), sprinkled with Himalayan or other natural salt, for about 15-20 minutes. Sign up for our Harvest Lunch, Outstanding at the Field on October 29th. Instructions Here. Posted in Fall, Vegetable Gardening in Dallas and tagged Dallas Farm to Table, garden recipe, Pumkin Seeds, Pumkins, vegetable gardening. Bookmark the permalink.